The body needed some R&R from all the heavy-duty eating we’ve been doing over the course of the week, so I decided to give my arteries a Master Cleanse by going to my favourite little Vegetarian Restaurant : Lotus Pond Vegetarian Restaurant. Located in Scarborough, this little gem’s been around for forever now. It’s a frequent hangout for local Monks and others practicing the Meditative Arts of Buddhism. The food here isn’t ashamed to be full-vegetarian. I find that the North-American mentality and its approach to vegetarianism is awkward. They keep having to prove that they’re better than Meat-Eaters, but at the same time, they fail to convey their message by churning out “meatless meat loaf” and other such lame dishes that highlight their inferiority complex. And, yes, I’m referring to YOU – Boston Vegetarian Food Festival. I’ll cover that in a later post. I like it when my vegetarian food tastes completely new and foreign. I like it when I’m not forced to chew on Seitan, or TVP (Textured Vegetable Protein. Can you say “ew“?). Maybe it’s because I can have my beef and eat it too that I don’t crave meat substitutes. But I really don’t think there’s an excuse for TVP. Asians have been living meat-free lives for generations (India, China, Tibet, you name it). They’ve flourished and you don’t see them saying “Wow. What I wouldn’t give for a nice chunk of Textured Vegetable Protein right about now with my curried lentils”. Do I sound angry? Sorry, the Festival I attended a couple of weekends ago got me really worked up. So Lotus is awesome because they have unique takes on classic dim sum dishes, as well as creative uses of vegetarian ingredients. Some favourite dishes of mine include their delicious Egg Tofu and cashew dish (Not a Vegan Restaurant, as you now know), spicy curried pies, nourishing “Super Soup”, stuffed eggplants & steamed milk pudding. We didn’t have room for all of my favourites, so we just chose a few (including some of E’s mom’s choices). Since we don’t have air-conditioning in our Boston Apartment’s Kitchen, I’ve refrained from making soups in the summer. This left a huge void in my life that I had to fill with my favourite Lotus Soup – the aptly named Super Soup. I just love that name. It evokes so many images in my mind of super heroes and magical herbs. 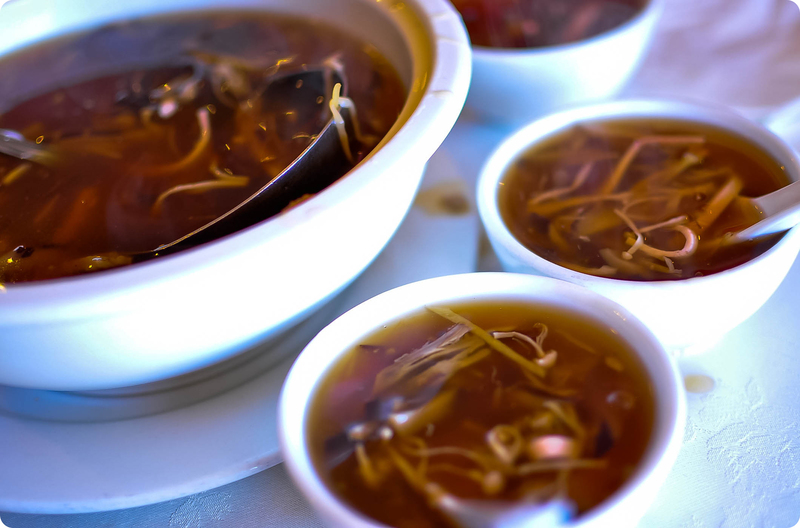 It’s just a simply flavoured soup that is based on their classic soup stock used for their Vegetarian Shark’s Fin Soup. On top of that, they add some extra seaweed and kelp for texture. The inspired addition is the usage of dried orange peel. This makes the soup smell divine when the herbal nuances waft up to your nose when a steaming bowl of nourishing soup is placed before you. It really helps clear congestion and is truly a “super soup”. It’s only $11 a pot (serves 6-8, or 3 people if E & I are at the table), so give it a try. They also come with crispy fried wonton strips that aren’t even a touch oily. Curried Pie is one of my favourite junk food treats here. The crispy wafers set off the spicy curry perfectly. The fluffy potatoes inside are a perfect texture. That, paired with the juicy peas, really round out the dish brilliantly. It’s just a fun dim sum dish and I get it every time. It’s like a Chinese Samosa. E’s mom needed her fix of “Ham Soy Gok”, a traditional dim sum dish usually made with pork fixings. 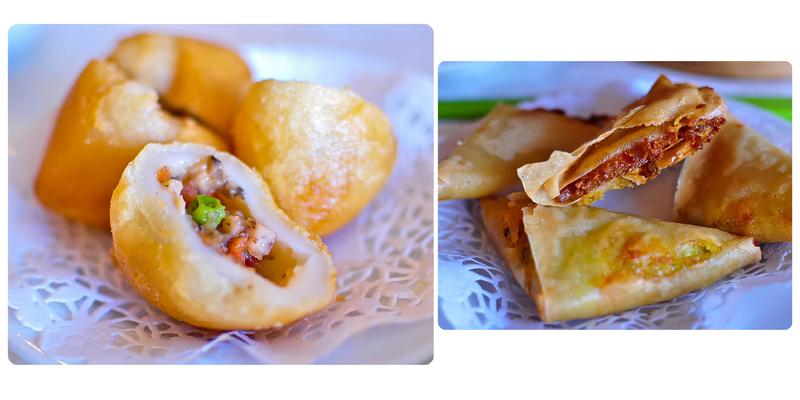 The fried dough in this case is instead stuffed with peas, taro, mushrooms & carrots. It’s super sweet and a nice variation of the salty-sweet original. The vegetarian BBQ Pork buns are never a favourite of mine either. But that’s because I can have the real thing. Lotus’ vegetarian proteins are fabulous though (their mock BBQ meats), so it’s not too bad when they’re in bun form. I, however, usually don’t even enjoy BBQ pork buns, unless it’s Grand Chinese Cuisine’s version with a deliciously decadent abalone sauce in it. E’s mom can’t eat pork though, so this is a nice way for her to get her ‘fix’ without breaking the covenants. Another failure was the Chinese version of the Korean Bibimbap. I think E’s mom & I just have very different tastes and ordering styles. I don’t think she appreciates my choices either LOL! The rice was crispy, but lacked any imparted flavours. 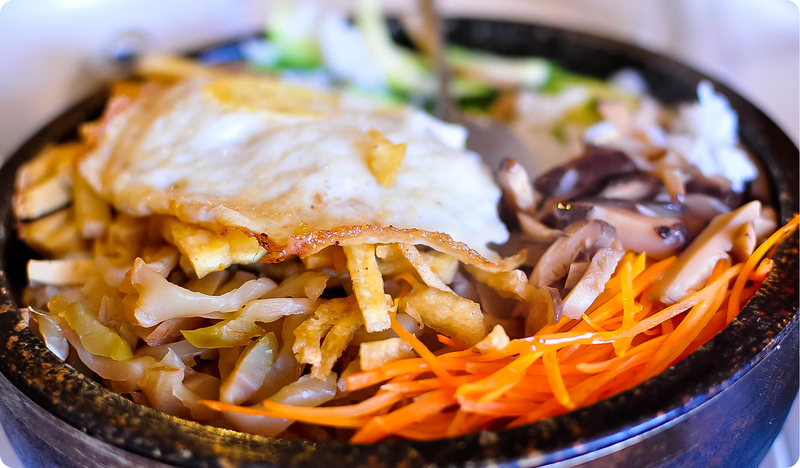 Korean Bibimbap rices taste good on their own without added sauces. We got some soy sauce for this dish (instead of the traditional and tasty gochujang red sauce), which made me immediately think of those rice street vendor stalls in Hong Kong. The veggies weren’t enough to give this dish any sort of discernible flavour. It tasted like two very distinct components being mashed together. Next up was another one of my orders. This was the first time I got their soup dumplings. It was served in a nice, simple and savoury broth. 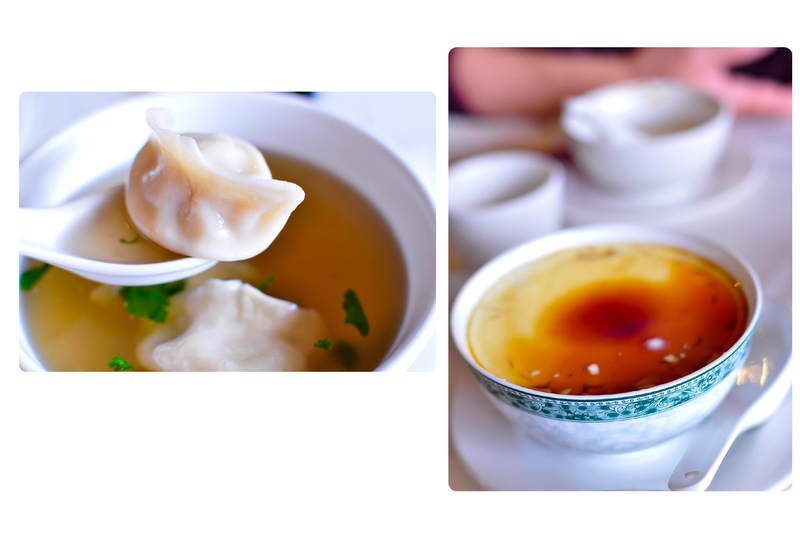 The dumplings were hand-formed and had pieces of vegetables and vermicelli within its pillowy-soft confines. I really liked this dish, especially on a cold Fall afternoon. At the end of every meal at Lotus, I need my fix of Chinese “Tong Sui” or sugar waters. These sweets are just to my taste – not too overpoweringly sweet. Just enough to satisfy the sweet tooth without going into a sugar-induced coma. I usually get their stellar Steamed Milk Pudding with Ginger syrup. The texture of the pudding is silky smooth. The ginger-scented syrup is a perfect foil to the sweet milk. The spiciness of the ginger really makes this a comfort dish during the Winter months. I didn’t get to sample some of my favourites, but I’ll probably be heading back here during the Holidays, so stay tuned for an updated review of Lotus. It’s definitely somewhere a “meat-aterian” (OK omnivore) and a vegetarian come and find happiness.